I may never make another pancake after making these waffles. 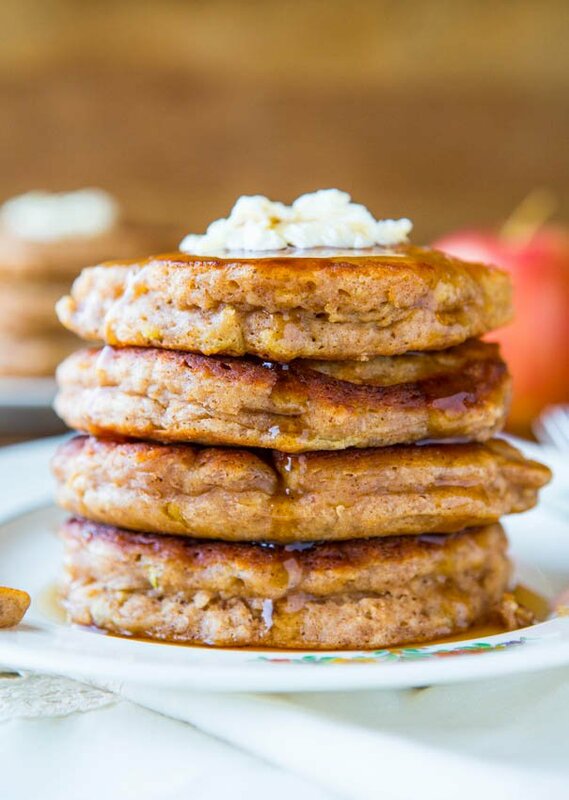 They taste like pancake-house waffles, and are mindlessly easy to make. I don’t know why I haven’t made waffles in ages, but I was doing some cupboard rearranging and noticed my very neglected waffle maker. So I dusted it off and made classic buttermilk waffles. They’re crispy on the outside, yet softer and fluffier in the interior. 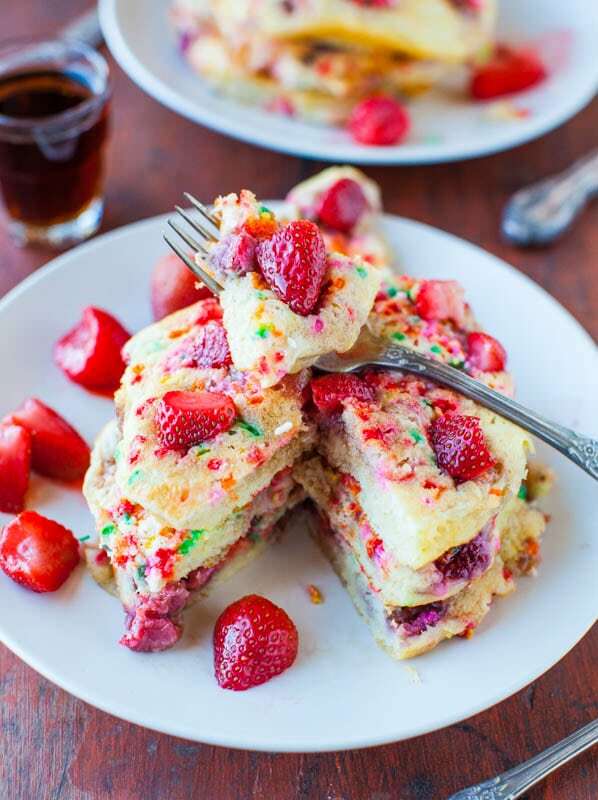 As fast and easy as using boxed pancake mix, but so much better. I prefer waffles to pancakes by a longshot, for so many reasons. Usually after a plate of pancakes, I feel like I have a 10 pound bowling ball in my stomach for most of the day, but don’t as much with waffles. Even though pancake batter and waffle batter can be interchangeable many times, waffles seem lighter and fluffier to me. Bonus. 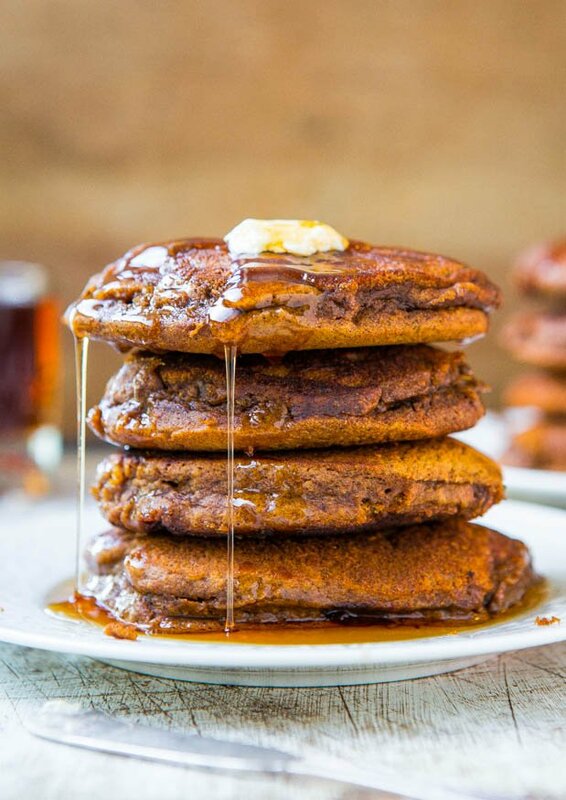 With pancakes getting just the right amount of batter so they’re not paper thin, but not too thick or else they never really cook though, can be tricky. And I’m horrible at flipping them. I’ve been known to accidentally flip a pancake onto the neighboring pancakes, thereby mutilating a whole skillet of pancakes in one fell swoop. With a waffle maker, you just close the lid. How nice. I kept the recipe small, but feel free to double, triple, as needed. It makes just 6 small square waffles in my waffle maker. Make a double batch and freeze some for busy weekday morning DIY toaster waffles. I prefer putting one of these into the toaster than an Eggo. They’re so easy to make. Dry ingredients in one bowl, wet in another, pour wet over dry, mix until just combined. Don’t overmix or you’ll have tough pancakes. Lumps are supposed to be present. Or make buttermilk by souring your own milk. Add about 1 tablespoon vinegar or lemon juice to 1/2 cup milk, wait for 10 minutes for it to curdle, then use as indicated. I made the berry preserves by combining a one pound bag frozen mixed berries from Trader Joe’s, with sugar, and the juice of one lemon. 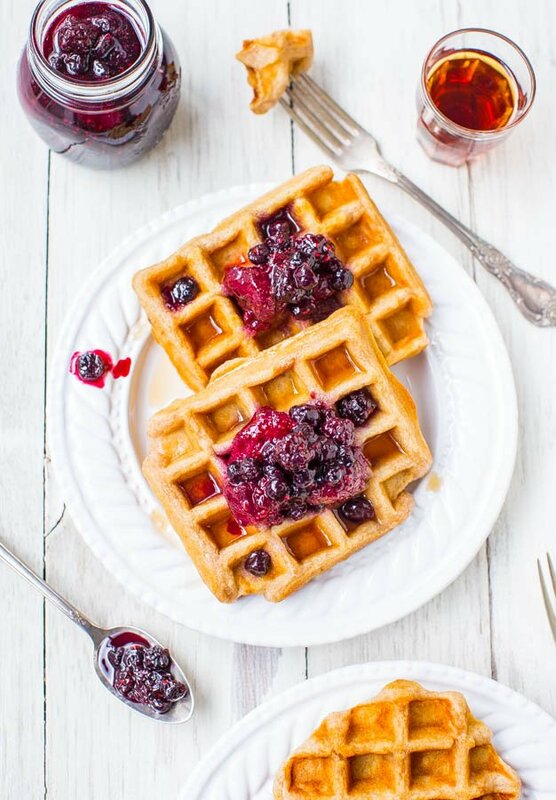 The recipe makes 1 pint of preserves and whatever you don’t use on your waffles is perfect for anything you normally put jam or jelly on. The sweet berries, contrasted with the very subtle tarter lemon, and will make you want to eat this straight from the jar. I did. 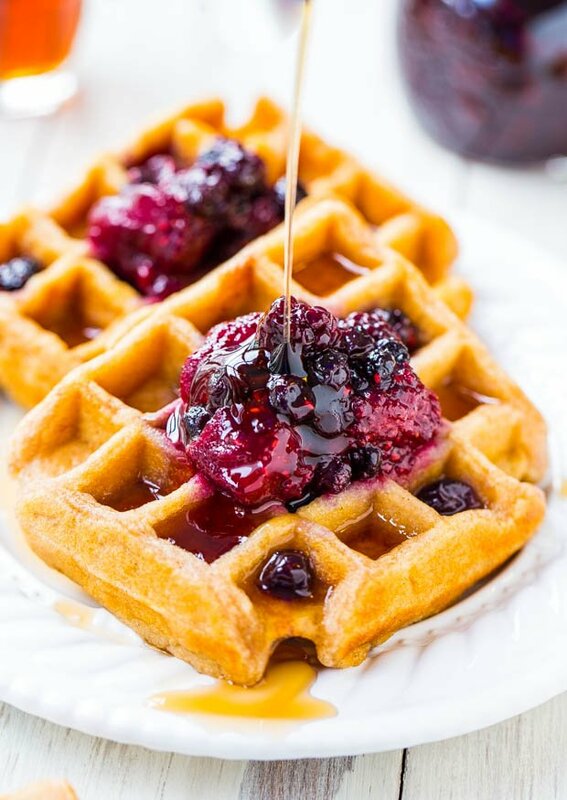 Or have another waffle just so you can have more preserves. Waffles are easier than pancakes. 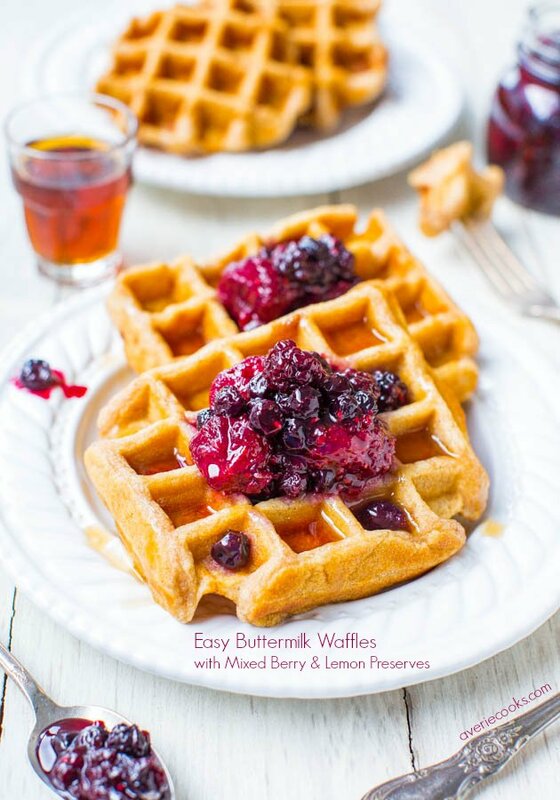 Nothing to flip one by one, and these classic buttermilk waffles are ready in minutes. They’re as fast and easy as using a boxed mix, but so much better. They’re crispy on the outside, yet softer and fluffier in the interior. I served them with mixed berry preserves that I made with frozen berries and the juice of 1 lemon. Reduce lemon juice to half the lemon if very sensitive to lemon flavor. 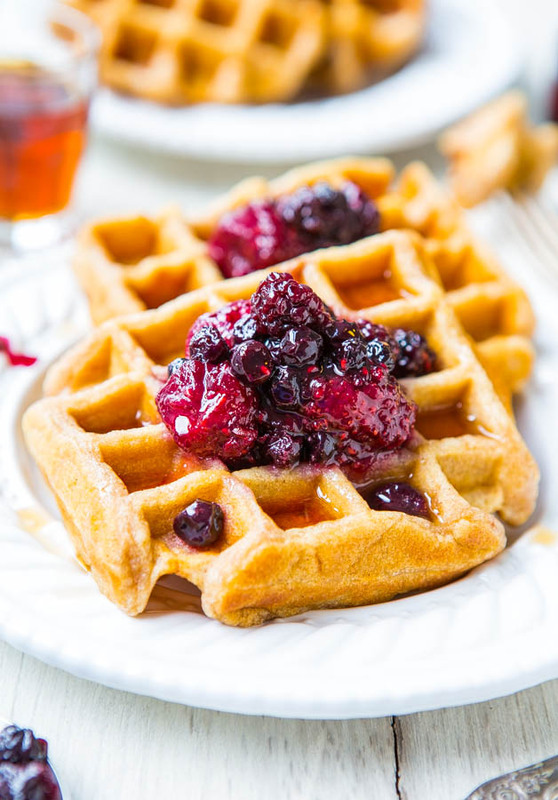 The preserves are sweet with chunky texture, and a perfect waffle topping. 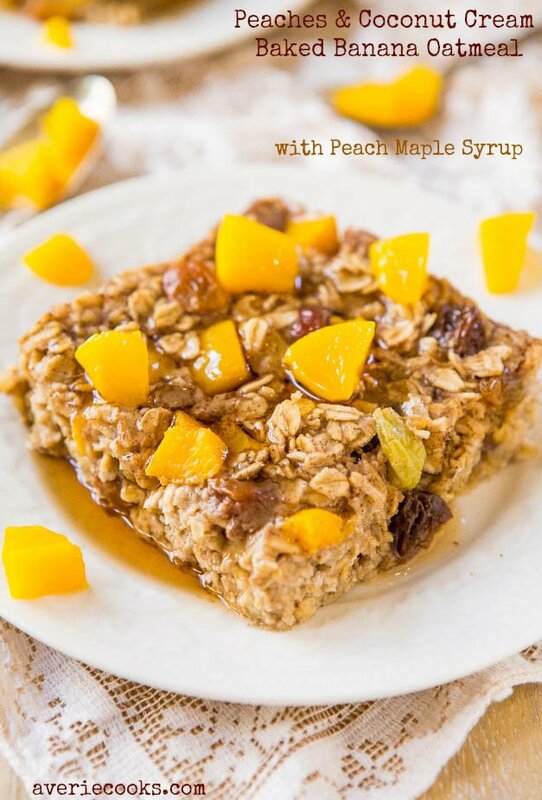 Use syrup, confectioners’ sugar or another favorite waffle topping if preferred. The batch only makes 6 waffles, and consider making a double batch to freeze some for DIY toaster waffles. 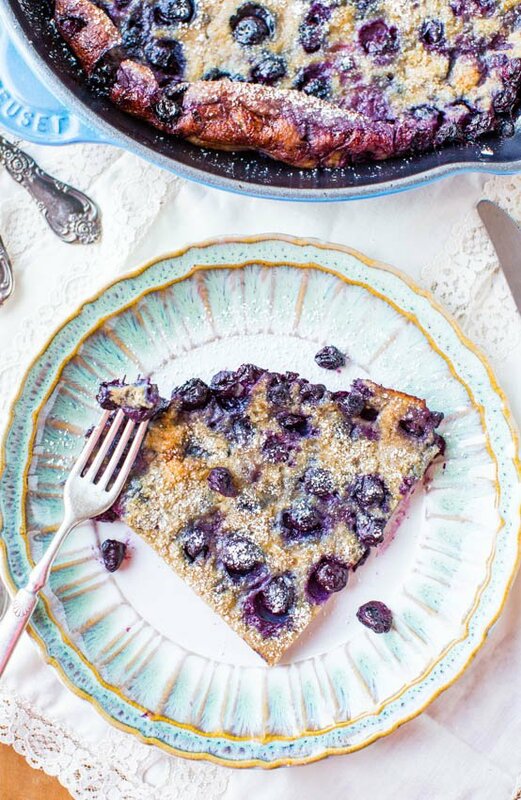 Mixed Berry and Lemon Preserves – In a medium saucepan, combine berries, sugar, lemon , and heat uncovered over medium-high heat until mixture comes to a rolling boil. Stir frequently until sugar dissolves. After mixture is boiling rapidly, turn heat down to low or medium-low, and allow mixture to simmer uncovered for about 30 to 45 minutes, or until the liquid volume has reduced by half and mixture has thickened some. The sauce doesn’t get ‘thick’ per se, but it does tighten up as the liquid volume reduces. I used frozen berries straight from the freezer without thawing fist, and needed to simmer for 45 minutes. If your fruit is already thawed, the simmering time will be reduced. Transfer preserves to a glass jar with a lid, or heat-safe container; set aside. 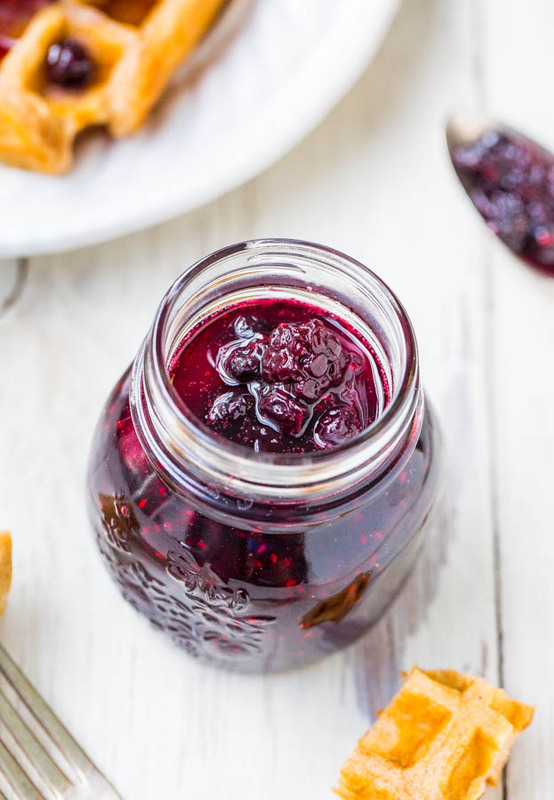 Extra preserves will keep airtight at room temp for up to 1 week and up to 4 weeks in the refrigerator. I have not tried canning this with a water bath so cannot speak to processing times. Waffles – In a large mixing bowl, whisk to combine first 6 dry ingredients (through optional salt); set aside. In a glass measuring cup or small bowl, whisk remaining 4 wet ingredients. Pour wet mixture over dry, and stir gently until just combined; don’t overmix. Batter will be thick and with some lumps, don’t try to stir them smooth or waffles will be tough. Preheat waffle maker to manufacturer’s directions, and spray grates with cooking spray. When waffle maker is hot, add batter, leaving a bare margin of about 1/2-inch on all sides. Cook for 3 to 5 minutes, or as manufacturer’s directions indicate, or until waffles are done, cooked through, and lightly golden. 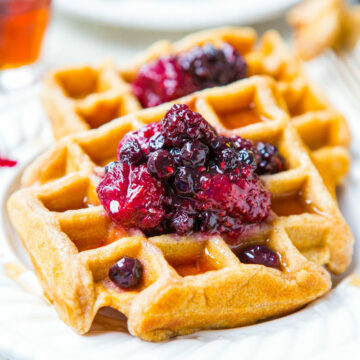 Carefully remove waffles, place on serving plate, and top with mixed berry preserves. 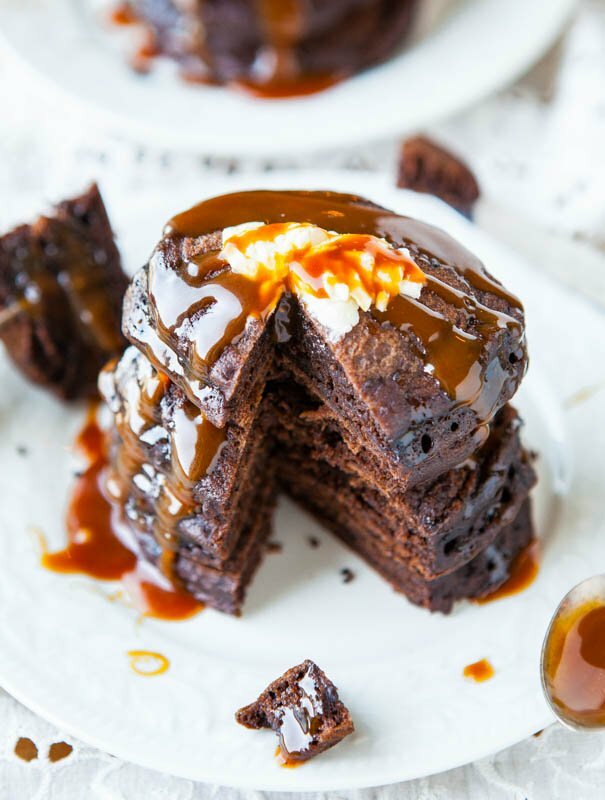 Optionally, dust with confectioners’ sugar, serve with maple syrup, or with your favorite waffle topping. These look fantastic. You are right. Waffles are so much easier than pancakes and yet I always go to pancakes first. Crazy?!?! 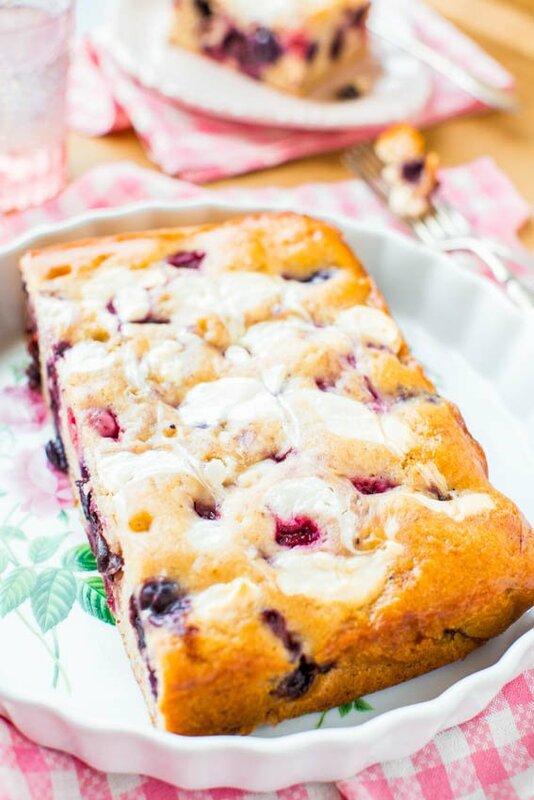 I love the mixed berries on top too. Iv always had trouble getting my waffles crispy on the outside. iv tried a large variety of recipes but they would still come out soft and wimpy. Until one day I was reading tips for yet another recipe and it was recommended to cook at the highest heat on the wafflemaker. I was using a lower setting because I didnt want them to be too dark. Now that I think about it, higher heat makes sense. I havent tried this method yet but I will starting with your recipe. And I like the fact it doesnt call for the whipped egg whites… too much like work. Thanks for another opportunity to make great waffles!!!! I’ve always read with waffle makers to set them to high. Honestly I think mine only has 1 setting, on (which is ‘high’) but yes if you have a choice, I’d try high. Now I can’t stop thinking about waffles! These look insane! I’m loving that topping! I was on an 8 mile run earlier and guess what I was thinking about: your CAKE! I want to inhale that meringue. Seriously your must stunning work to date! These look UNBELIEVABLE. I just so happen to have a day off this coming weekend, and these seem like the perfect way to celebrate! 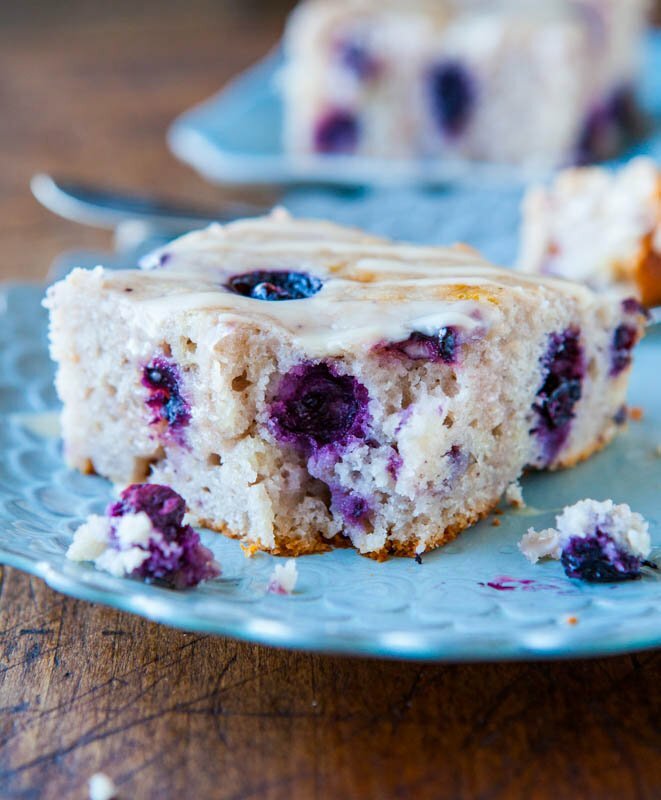 Pinning this one for sure and sharing, can’t wait to make especially that berry and lemon preserves YUM! This is one of those times that I am reeeeaaally bummed that I got rid of my waffle maker. Actually, it was gross and broken so it wasn’t like I was heartless and just tossed it, but I have yet to replace it and it is times like this when its absence tugs at my heartstrings just so. 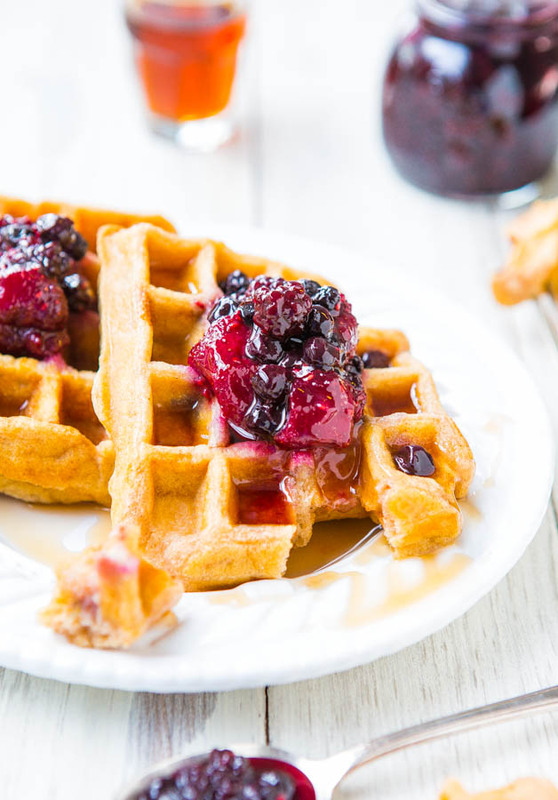 These waffles — can’t even deal. And the mixed berry & lemon preserves looks wonderful. Call me crazy, but I kinda want that on a PB&J. I don’t make waffles nearly as often as I should. For some reason, I find myself making them more during the summer months. I need to change that. Love berry-lemon preserves here! Thank you! 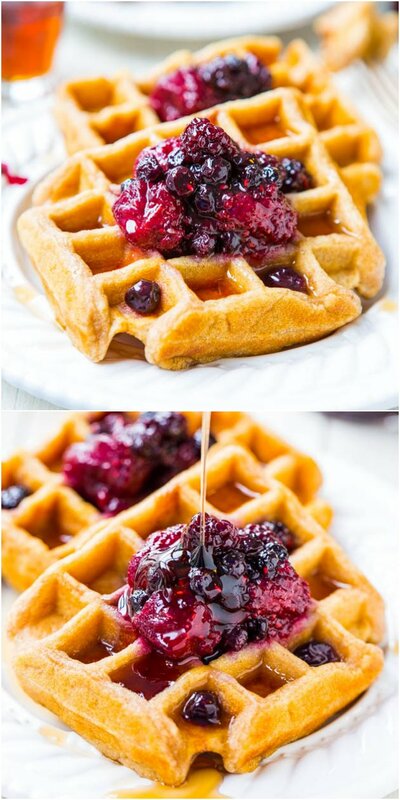 this is the best waffle recipe ever! i tried it today and the waffles were so delicious! everybody loved them, what makes me even happier is that my brother hates sweet things and he ate all of them! I added sugar pearls which makes them 100 times better because this sugar melts while the waffles are in the machine. Also i tried your apple pie pancakes, another yummy thing hahah. So thank you for sharing your recipes, today i got tons of compliments! 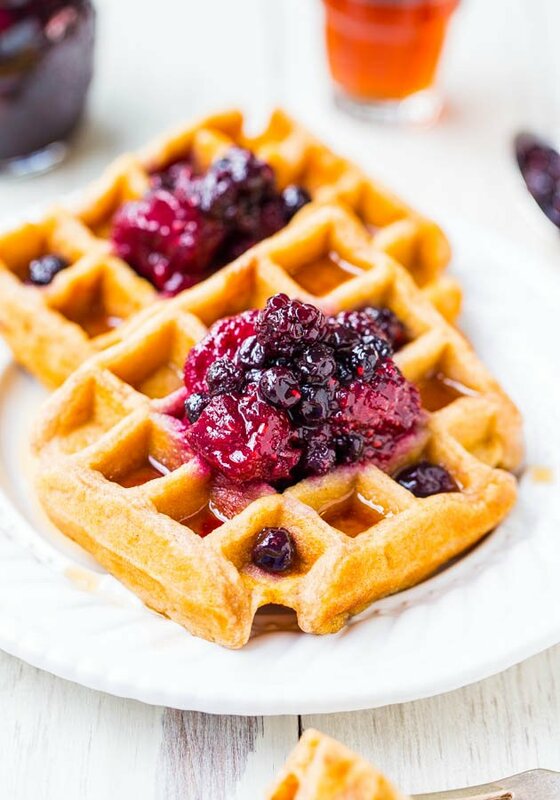 So happy to hear you loved the waffles and are calling the recipe the best ever! Thank you! And that even your bro ate them. Sugar pearls sound amazing here! 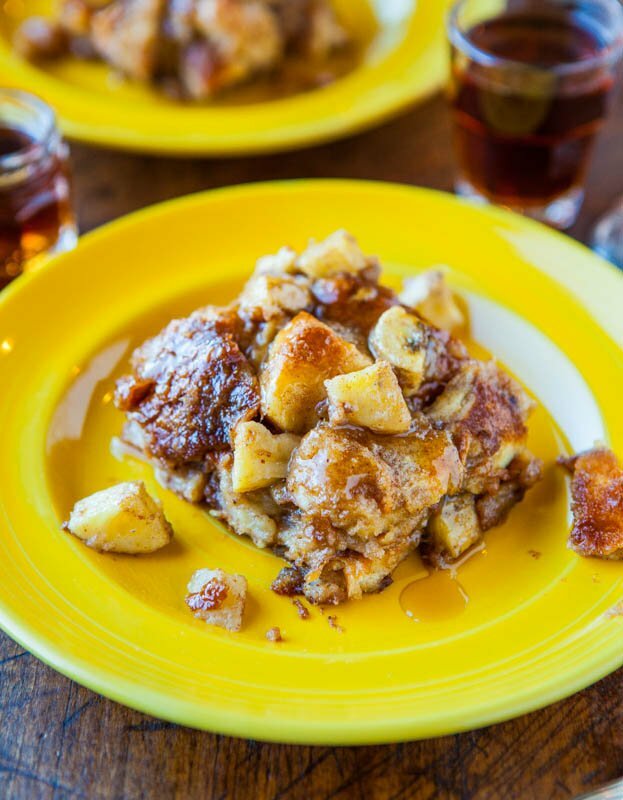 And glad you are a fan of the apple pancakes, too! I’m having family over in a few weeks for a Saturday brunch and am considering setting up my Belgian waffle maker with batter so people can make their own if they want one. Do you know if this batter holds well overnight? I’m hoping to prep as much as I can the night before. Thank you! I’ve never tried making the batter in advance so I cannot say whether that’s advisable or not. Thank you for the feedback. I think I’ll make a test batch and see what happens. Will let you know! Did a test batch and it worked wonderfully! I left the batter very lumpy, put a lid on my mixing bowl, and left it in the fridge for my husband the next morning. He gave it a good whisk and make his waffles. Definitely going to use this for my family brunch this weekend! Great field report and thank you for sharing! 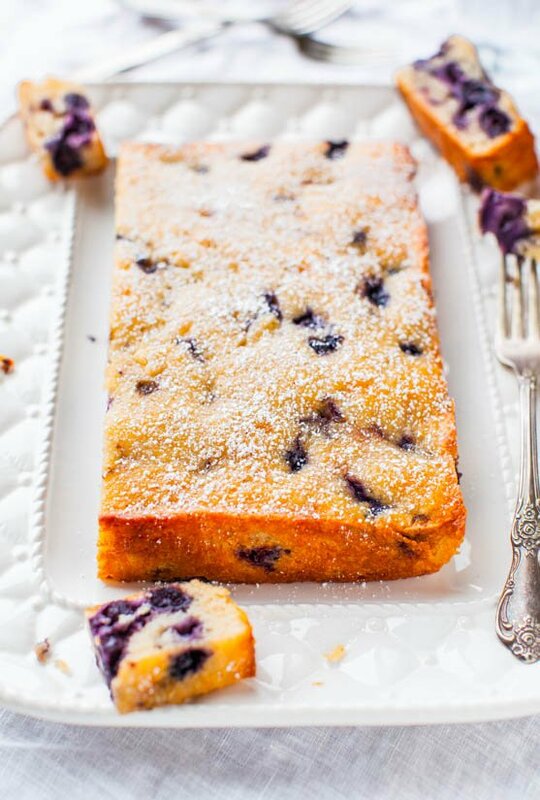 Wonderful to hear it works as a make-ahead batter! I will be trying to make DOLLAR pancake instead. Practice makes perfect.haha.